"Bring my brother back!" New Films International has debuted a trailer for James Franco's adaptation of William Faulkner's novel The Sound and the Fury, about the Compson Family living in the deep south in Mississippi in the early 20th century. Starring as Benjy Compson (as seen above) is none other than James Franco himself, with quite an ensemble cast to boot: Seth Rogen, Danny McBride, Scott Haze, Tim Blake Nelson, Loretta Devine, Joey King, and Ahna O’Reilly. This doesn't have the best reviews, but Dan Romer's Beasts of the Southern Wild score is a nice addition to the trailer. That's all to take not of. A look at the trials and tribulations of The Compson siblings, living in the deep south during the early part of the 20th century. The Sound and the Fury is directed by actor-writer-filmmaker James Franco, who has directed the films Child of God, Interior. Leather Bar., My Own Private River, Sal and many others previously. The screenplay is written by Matt Rager, adapted from the iconic William Faulkner novel of the same name first published in 1929. This premiered at the Venice and Toronto Film Festivals back in 2014. 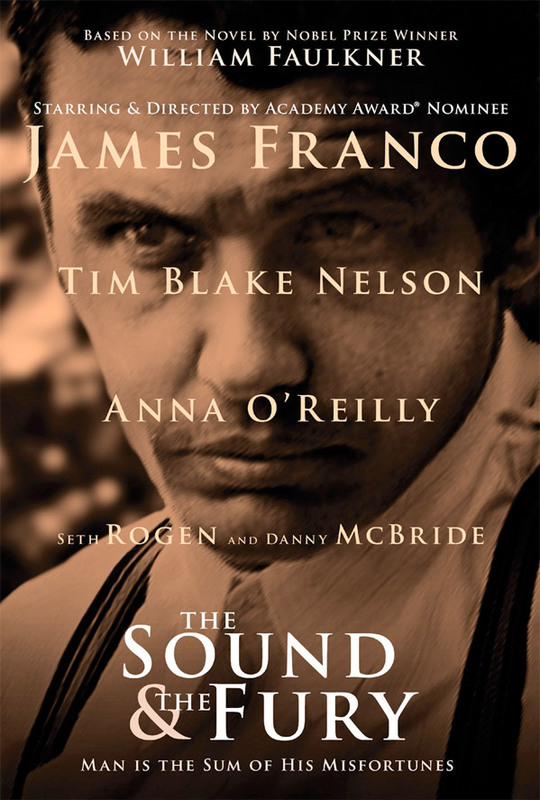 New Films International has already released Franco's The Sound and the Fury limited in the US + on VOD. Camera shots felt too tight. I've noticed Franco's constant use of slo-mo too. Hopefully he matures as a filmmaker. not anything special but definitely not as terrible as the reviews say it is. This is one of my favorite works of American Literature. I really, really hope Franco does it justice. Er, did they make this just so they could get high and goof on it? Just as long as he doesn't go full retard. You never go full retard! I like the music but I kinda hate Franco. I wish he would just play the normal idiots that are closer to his real life and not the actually retarded ones. seems like a good performance. try going into it with an open mind.. people complain about these guys only doing "stupid" or "Stoner" roles...well, now you can see another side of them. Man I'll try but can he play something other than 'dumb'? 127 hours wasn't terrible. he also has done a lot of Indie drama roles that fit the bill. he's mostly known for the stoner stuff because it gets the most light shed on it, but he's definitely capable of more. I'm not saying the guy is Daniel Day-Lewis, but he's got some acting chops when he wants to. I like how McBride and Rogen have their names in the trailer but a merely cameos and those were probably their whole scenes in the trailer lol. I get they're your best friends but their names shouldn't be in the trailer. it's not misleading, it's sales bro. How do you know those are comeo roles anyway? This obviously isn't a satire. It looks like a lot of good performances. I kept waiting for this trailer to pick up with it's hilarious twist but it never happened. LOL- I LMAO at your comment.